One of the first degrees of its kind, the Bachelor of Science in Unmanned Systems Applications (BSUSA) prepares students for administration, operations and development work in the emerging unmanned systems field. As one of the first degree programs to focus on this burgeoning field, the Bachelor of Science in Unmanned Systems Applications (BSUSA) focuses on the growth, innovative development, and effective use of unmanned system technology across the respective domains (air, space, ground, and maritime). Through extremely focused and continually updated curriculum, students will learn how unmanned systems are utilized on land, in water, in the air and in space today — and that we’ve only just begun to explore their full potential. Courses will examine major industry challenges such as interoperability, autonomy, airspace integration, communications, education and training, propulsion and power, teaming, and regulation. Students will customize the BSUSA to fit their desired career path by selecting from three learning tracks: Administration, Operations, or Development. While each specialization focuses on a different aspect of the unmanned systems industry, all will position you to play a prominent role in the field as it continues to grow. Once the domain of military and government agencies, unmanned systems have entered the civilian and commercial sectors and are transforming the world as we know it. From the driverless cars roaming our streets to the unmanned aircraft soaring through our skies, leading technology companies, news outlets, sports franchises, and commercial enterprises all over the world rely on unmanned systems for critical aspects of their operations. The Bachelor of Science in Unmanned Systems Applications (BSUSA) at Embry-Riddle Worldwide offers graduates career opportunities that go far beyond engineering and development. Companies also need skilled administrators, operators, managers and business professionals. Students will customize the BSUSA to fit their desired career path by selecting from three learning tracks: Administration, Operations, or Development. While each specialization focuses on a different aspect of the unmanned systems industry, all will position graduates to play a prominent role in the field as it continues to grow. Administration Track: The emphasis is on managerial aspects of unmanned systems applications, ranging from business considerations, and legal and regulatory requirements to environmental compliance, safety management, or contracting and procurement. Operations Track: This area focuses on individual mission support such as mission planning, payload selection, or sensor data treatment. Development Track: This area bridges the gap between engineering aspects and operational requirements. The focus is on task-oriented implementation, combination, and/or (re)design of existing technologies to suit new applications, including software adaptation to match requirements. Administration - Focuses on managerial aspects of unmanned systems applications. Operations - Focuses on task oriented mission planning and execution in unmanned systems operations. 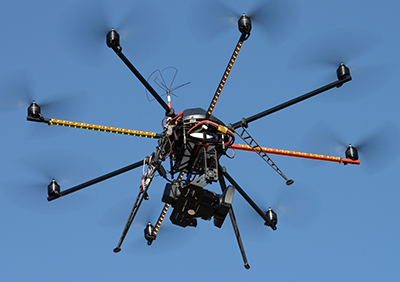 Development – Focuses on engineering and design aspects of unmanned systems. BSUSA students who wish to continue on to a master's degree may enroll in the BSUSA to MSUS 4+1 program as outlined in this program. Students will select from one of three available tracks of study, each containing a total of 12 courses (36 credit hours). Students will fulfill six (6) required support courses (18 credit hours) within the track of study and will fulfill six (6) additional courses (18 credit hours) by selecting one of the available minors and making up remaining credit shortage with upper level electives (300 or 400 level courses). ** Students who select the Development Track will complete 19 credits and will complete 121 total degree requirements. Students will chose from the respective list of available minor (selection of existing minor within the WW catalogue) to complete their chosen track requirements. Course requirements for the selected minor are as outlined in the minor description (within the Worldwide catalog), with which students will have to comply. The depicted number (in parenthesis) of additional electives that result from each choice of minor is for reference only and is based on current course/credit requirements for the minor and course/credits requirements already accomplished in the BSUSA Program Core and/or Track support. (This number of remaining electives may be subject to changes with catalogue changes to a minor). **Students who select the Development Track will complete 19 credits and will complete 121 total degree requirements. This program is for exceptional students who are committed to continuing their education through the Master’s degree. This fast-paced program allows qualifying students the opportunity to complete both the Bachelor of Science in Unmanned Systems Applications (BSUSA) and the Master of Science in Unmanned Systems (MSUS) in five academic years. After spending three academic years in undergraduate-level study, BSUSA students who are accepted in the BSUSA-MSUS 4+1 program option will be allowed to take up to three (3) MSUS courses to replace an equal number of remaining BSUSA courses during their senior year. The selected courses can only replace BSUSA minor requirement or additional electives in each respective BSUSA track and may not replace program core or track support courses. Before selecting the courses to be taken, students must confer with an advisor to ensure that the courses selected are suitable and align with their selected MSUS area of concentration. A grade level average of B or better must be maintained for selected MSUS courses while enrolled in the BSUSA-MSUS 4+1 program. Any final BSUSA credit hour requirements not accomplished through MSUS course selection will have to be satisfied through upper level undergraduate electives. Upon successful BSUSA program requirement completion, students will be automatically enrolled in the MSUS program and their chosen area of concentration and can complete their degree within one year. Students who fail in any of their selected MSUS courses or fail to maintain a grade average of B or better while still completing BSUSA degree requirements will be removed from the 4+1 program option, have credit awarded to the BSUSA degree only, and may continue to complete their BSUSA degree program. In this case, published BSUSA minor requirements and/or upper level electives can be used to fulfill remaining BSUSA credit requirements. This special program will challenge students and develop their knowledge, skills, abilities, and attitudes in the concepts of unmanned systems while integrating their gained experience in unmanned systems applications. As a minimum to be considered for acceptance to this BSUSA-MSUS 4+1 option, applicant students must hold at least a 3.00 GPA, completed at least 88 credit hours of the BSUSA program requirements to apply and demonstrated superior academic capability.